Portsmouth’s Matthew Fraulini dribbles up top with the ball. Portsmouth’s DJ Eley moves up the floor with the basketball. 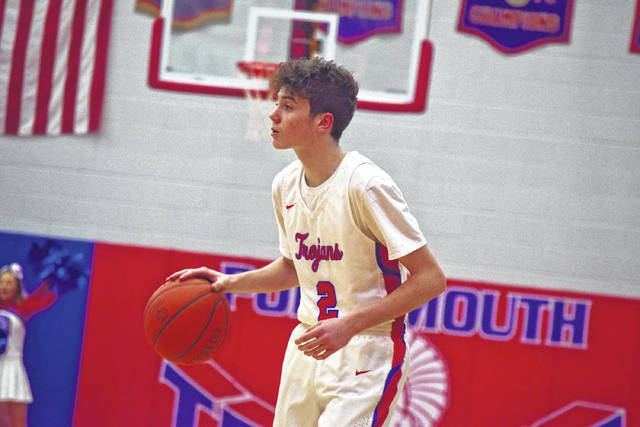 Over the course of its history as a basketball program, the Portsmouth Trojans have been no stranger to deep postseason tournament runs. Four state titles and two OHSAA Final Four appearances within the last decade would tell one that much. 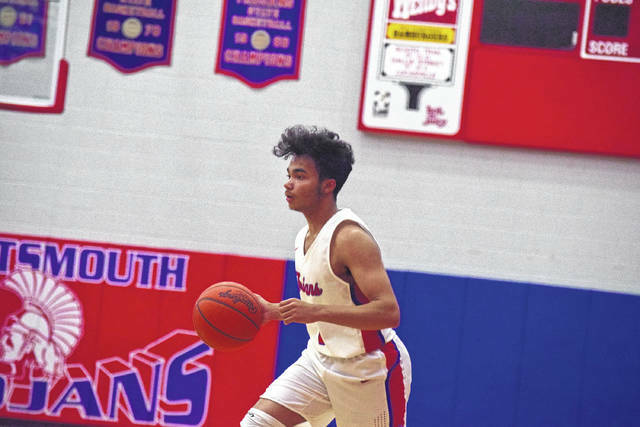 However, if Wednesday evening’s Division III Sectional Semifinal affair against the Chillicothe Huntington Huntsmen was any indication, Portsmouth may very well contend again at the regional stage. Daniel Jordan’s 24 points, along with another balanced scoring effort where five players collected at least six points or more, allowed the Trojans to kick off its postseason journey with a victory as Portsmouth defeated Huntington, 69-46, in a contest that was played at the Downtown Arena in Waverly. From the outset, Portsmouth held the point as DJ Eley and Matthew Fraulini each knocked down a pair of treys to open up the game’s scoring. Chillicothe Huntington battled back to cut the Trojans’ advantage to a 6-5 margin as DJ Kinzer’s trey, along with a two-point field goal from Seth Beeler, allowed the Huntsmen to close in, but Portsmouth responded to the mini-spurt by closing the quarter on an 11-2 push — thanks in part due to five consecutive points from Isaac Kelly — en route to establishing a 18-7 lead at the end of the first quarter. When the Huntsmen closed again — knocking the margin down to an 18-11 tally at the beginning of the second frame — Jordan turned the contest into his own personal playground as the senior forward collected eight of the Trojans’ 13 points in the quarter. Fellow teammate Matthew Fraulini only aided the run as the sophomore guard held Elijah McCloskey to two points in the opening half of play as Portsmouth’s 13-4 second-quarter ending run allowed the Trojans to take a 31-15 halftime lead. In the third frame, Portsmouth proceeded to open up its advantage to an even greater degree as the Trojans, behind four points from Reese Johnson, took off on an 8-0 run as the Trojans ultimately took a 41-20 lead with five minutes to go in the third quarter of play. However, Chillicothe Huntington, who connected on seven three-pointers for the contest, used the long ball to battle its way back into the contest as the Huntsmen connected on five treys in the quarter — all in succession — to cut Portsmouth’s lead to a 47-37 margin at the end of the stanza. However, the Trojans’ balanced attack would prove to be too difficult for Chillicothe Huntington to overcome. Jordan’s 10 fourth-quarter points, including eight during an 11-2 Portsmouth run to start the fourth quarter, allowed the Trojans to establish a 58-39 lead, and Eley’s 13 points overall, along with nine each from Fraulini and Johnson, kept Portsmouth in control. With the victory, No. 3 Portsmouth (16-7) will face off against No. 6 Lynchburg-Clay on Saturday evening at 8 p.m. in Waverly. The Mustangs defeated Adena, 78-68, in Wednesday evening’s nightcapper at the Downtown Arena.